Preheat oven to 350°. 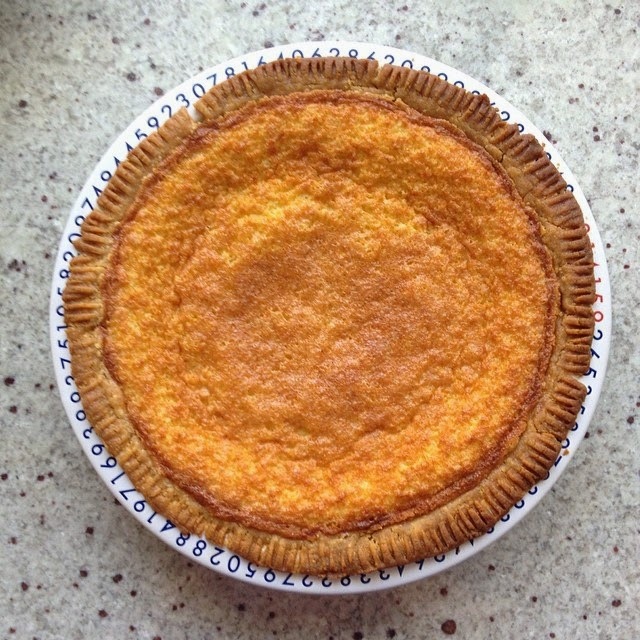 Place pie crust on a baking sheet. Mix together sugar, cornmeal, eggs, and buttermilk until blended. Mix in melted butter and vanilla. Pour mixture into prepared pie crust. Bake for about 45 minutes or until the center is set. Cool before serving. The thing about the online food world is that the seasons are marked by recipes. The current recipe perfect for fall that's on just about every site there is? Kale and Brussels Sprout Salad. I have seen versions of this recipe in my email, on twitter, on gorgeous pictures on Pinterest for days and days. The more I saw, the more I wanted to eat it myself. I guess I'm pretty susceptible to advertising, then. All that chopping is most certainly well worth it. I realized about halfway through dinner that I should have made a double or even triple recipe, because this salad was pretty much all I wanted to eat. A day later, I'm still thinking about how much I want to eat this. Good thing I have more brussels sprouts and kale in the fridge. Whisk together the dijon mustard, lemon juice, and olive oil. Add salt to taste (a pinch will probably do). In a large bowl, combine cut brussels sprouts and kale. Toss with dressing - make sure it gets all the leaves covered. Let sit 15-20 minutes before finishing. If the salad is still a little dry, add another splash of olive oil and toss. The dressing will wilt the leaves a little and make them softer. Before serving, add crumbled bacon, hazelnuts, and shavings of pecorino cheese. Toss and enjoy. Are you surprised to see a new post here? So am I! Truth be told, I got a little burned out with this project for a while, and when I finally had new things to write about, I wasn't too excited to actually follow through. But enough of my family has guilt-tripped me into writing again, so I guess you have them to blame for this (*cough*Berj*cough*). But a little over a year ago, I decided to try eating a gluten-free diet for a little while to see if it would clear up the myriad tiny health problems I had that all added up to me feeling terrible. I had had periods of eating low-carb (South Beach style) in the past where I felt great, but I assumed that was because I wasn't eating anything bad for me. I had an inkling that maybe wheat was the real issue. I won't bore you with the details, because everyone who has moved to a gluten-free lifestyle has a story to tell about how they got there, but suffice it to say that this has definitely done the trick for me. I don't have celiac disease (thank goodness!) or even an allergy, but I can tell the difference when I eat wheat, and that's all that matters. Screw all those people who think I'm being pretentious or have just jumped on the next diet bandwagon. I've spent the last year just getting my footing in the kitchen again. A lot of things I cook are already wheat-free (or are very easily adaptable), but do you really want to hear about egg scrambles and stir-fry? I've also never been big into cooking - baking has been my love. I haven't really jumped into gluten-free baking yet because I'm intimidated. Hopefully I can work out some of that intimidation right here. So are you along for the ride with me? It's ok if you're not; if I just write this for me and those couple of cousins and aunts who keep hounding me, I'll be alright. In an effort to eat more protein, I've been trying a variety of different jerkies. I'm fine with them tasting just like meat, but sometimes, they just taste off. 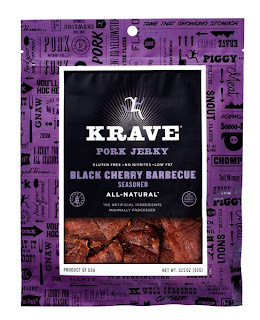 So I was intrigued when I came across Krave jerky at Target. They have more intense and interesting flavors than just about every other jerky company, and yet the flavors don't overpower the meat. I also love that they use gluten-free soy sauce. I've only had the chance to try a couple of flavors (the ones my store carries), but I am head-over-heels in love with the Black Cherry Barbecue Pork. It's nowhere near as sweet as the name implies, but it's not overly smoky like so many "barbecue" jerkies are. It's not as spicy as some of their flavors, either, so I don't feel like I'm burning holes in my tongue. Krave has eight different flavors, using three different kinds of meat, so if Black Cherry Barbecue isn't your favorite, I'm sure there'll be one to fit your palate. Can a companion book ever live up to its predecessor? Find out what I think about Code Name Verity's companion, Rose Under Fire. Last week, my parents had dinner with some friends at Seasons 52, a newish restaurant (part of a chain) in Burlington. Ever since, they've been talking about how much they enjoyed it and how they wanted to go back to try their Flights and Flatbreads menu. So I gamely tagged along with them Monday night to give it a shot. I went with the white flight (they also offer a red flight and, for $5 more, a red flight all rated 90 points or higher). I'm not a big wine drinker, because it all just makes me sleepy, but I know what I like. The Chateau St. Jean Chardonnay was fine, but I'm never a chardonnay drinker to begin with. I quite liked the Raats Family Chenin Blanc, but I found the Casillero del Diablo Viognier to be far superior. The flatbread selection was also impressive; you can pick any one (including the seasonal option) from the menu. I chose the Garlic Pesto Chicken flatbread, mainly because I love any pizza heaped with arugula. It was delicious, although I wanted even more of the creamy pesto that was drizzled on top. A bowl of it to dip into would have been ideal for me :) And the bread itself was super thin and crispy. I was impressed with how well it held up with so many toppings! My mother chose the Spicy Chipotle Shrimp, which I think was everyone's favorite, because the flavors (grilled pineapple, cilantro, feta) were so evenly balanced. My father ordered the Blackened Steak and Blue Cheese flatbread, which I happily avoided thanks to the blue cheese. And as much as I loved this deal, I LOVE the desserts at Season 52. They all come in tiny glasses, and they're all $2.50. So flavorful, so adorable, and just the right size. Seasons 52 is a chain with 40-something restaurants around the country. Burlington is the first in Massachusetts, though, with Chestnut Hill opening next week.